Summer is coming. Cooling towel is for you! Prettygoal Cooling Towels are made of a soft breathable mesh materical,super absorbent evaporative, soft feel snd chemical-free, superfine fiber. It is a physical technology, no chemical additives, healthy and environmental. Instant cooling, continued cool feeling, breathable, absorbent, quick dry, compact and lightweight. ① Firstly soak it into the cold water. ② The towel will absorb to save the water. ③ You can maintain the cold temperature for a long time. ④ If the towel loses coolness, please soak it into the cold water again. 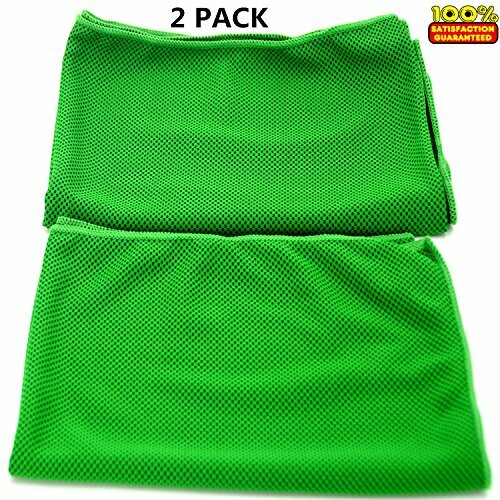 If you are not satisfied with the cooling towel, please contact us freely. We will take full responsibility for the quality of the products. Prettygoal Cooling Towel: It is a physical technology, no chemical additives, healthy and environmental. Safety and environmental materical: Breathable mesh material, super absorbent evaporative, soft feel snd chemical-free, superfine fiber. Advantage: Instant cooling, continued cool feeling, breathable, absorbent, quick dry, compact and lightweight. Colors:Green. Fashionable color, you have many chooses as you like. Multi-purpose: Great for outdoor activities, indoor exercise, physical treatment as fever or headache therapy, sunscreen protection. As a gift for outdoor workers, kitchen staff, sports enthusiasts and mother with baby.